Light rail is more affordable than traditional railway and can be built more quickly. New light rail networks tend to not only enhance the areas they travel through but also deliver significant urban renewal benefits, including increased land values and greater convenience to customers. The Gold Coast is a great example. 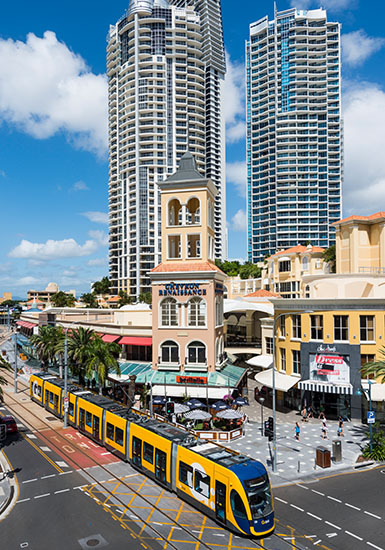 The convenience to Gold Coast residents and visitors has been enhanced by light rail; and $6 billion of investment is planned, due directly to the presence of the network and its uptake by customers. In the four Australian cities where light rail operates, regular customer surveys confirm it to be one of the most popular modes of public transport. Most customers regard it as modern, safe, clean and accessible. They are proud to say they use light rail services, more so than with other forms of public transport. Not only does light rail bring value to local communities, but it is a key promotional feature for international tourists, and is therefore vital to the prosperity of our cities. Some older networks, such as the one in Melbourne, have been around for than a century and have become an intrinsic part of the city. Keolis operates 17 networks around the world, including one of the world’s newest –on the Gold Coast – and the biggest and oldest – in Melbourne. Keolis light rail networks account for more than 670 million passenger trips per year. Light rail is either being built, planned, or is under consideration in a number of other Australian cities, including Sydney, Canberra, Parramatta, Newcastle, Perth, the Sunshine Coast, Brisbane and Darwin. A light rail network is also being considered for Auckland, New Zealand. Keolis Downer will operate the new light rail in Newcastle that will launch in 2019. Keolis Downer is currently the leading light rail operator in Australia. Governments planning to introduce or expand light rail networks can be confident that Keolis Downer has the necessary experience and expertise to deliver successful networks. Keolis Downer has also proven its ability to deliver light rail in the context of broader transport networks. We can provide transport solutions as a sole operator of all modes or just of one. Further, we have experience in working with a variety of contractual agreements such as a PPP (Gold Coast Stage 1 and 2, Nottingham Stage 2), a franchise (Melbourne), or the delegated management model popular in many French cities (e.g., Bordeaux, Lyon, Tours, and Angers). Keolis is trusted by public transport authorities around the world and has delivered 20 new or extended light rail projects in the past 15 years. Given this extensive experience, Keolis has unparalleled knowledge about how a city and its citizens adjust to the presence of light rail. This includes managing safety campaigns to educate motorists, pedestrians and passengers about how they should board and travel on trams. Keolis can also offer insight into how a multimodal network should be adapted to maximise the value of light rail networks and minimise the duplication of services. On the Gold Coast, Keolis Downer worked with the client Translink and local bus operators to enable extended operating hours for the bus network and greater frequency of its services.